Gold had a fairly "lively" session on the first day of May and it offered (perhaps unwanted) thrills to both the bulls and the bears within a span of just a few hours. Spot quotes ranged from highs near $1,672 to lows under $1,660 before and after the coffee-break hour. Elliott Wave updates issued late Monday offered up the possibility that gold might be in the midst of a bounce that might conceivably carry it to near the $1,700 level prior to the start of a new down-leg. What remains to be seen is how successful (or not) the attempts to breach the $1,675 resistance wall prove to be. However, after the ISM US manufacturing activity data was released, the bears retook the battle flag and regained control, aided by a rising dollar and the notching of a four-year high in the Dow. Black gold, on the other hand, had a very nice day, thank you, owing to the same ISM figures that lifted spirits in the equity market. This morning, the situation was largely the same, only…more so. A sharp contraction in manufacturing activity in the EU sent the common currency skidding and local equity markets towards lower value grounds. The HSBC Chinese flash PMI report did not help matters for commodities either (copper fell by 1.33% for example), as albeit its reading was one point better than the previous gauge, it still flashed "contraction" in the world’s second largest economy. The dollar benefited from these developments once again, climbing by more than half a percent (to 79.26 on the index at last check). Thus, gold spot prices opened with losses on the order of about $10 and near the support level that the $1,650 area is thought to be able to now offer. On the forecasting front, bullion banker HSBC said it looks for gold to trade "in a wide range of $1,525 to $1,950 for the remainder of 2012 and [it] anticipates that bullion markets will remain volatile." Others see matters a bit… differently and argue that certain other developments might be in store for the precious metal. Silver dropped nearly 50 cents and started the midweek session out under the $30.50 mark per ounce. Platinum and palladium shed from $6 to $8 in the process as well, with the former quoted at $1,560 and the latter at $673 the ounce. Rhodium was static at $1,350 this morning. On the automotive front, it is worth noting that Chrysler reported its best April sales level in four years with a 20% gain vis-à-vis the amount of iron that was moved off of dealer lots in 2011. In fact, the Big Three just finished their best sales trimester since 2008’s first quarter-just prior to the financial crisis hitting hard. It is worth noting that gold’s price has not declined for three consecutive months since the trimester leading up to May of the year 2000. The yellow metal has lost more than 4% since the late part of January and everything from coin sales to ETF balances has been reflecting that situation. The SPDR Gold Trust saw its holdings fall by 0.47% from the previous session to 1,278.32 tons by April 30, the lowest since mid-February. Aggregate holdings in bullion-backed exchange-traded products fell 4.8 metric tons to 2,385.6 tons yesterday, according to data we sourced from Bloomberg News. We have repeatedly warned about the fact that the gold market has become increasingly dependent not only on the mirage of a fresh round of QE by the Fed but also on off-take by the gold-based ETF sector. UBS analyst Edel Tully wrote in her morning report today that "significant ETF buying will have to resume in order to breathe some life back into gold. 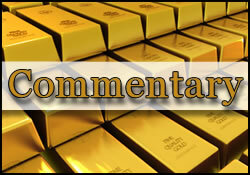 Absent that resuscitating factor, we think gold is likely to continue its aimless wander." Finally, on the all-important physical front for bullion, the Bombay Bullion Association Gold reported this morning that physical gold imports by India plunged to 30 to 35 metric tons in April, as compared to the 90 tons that were taken in by that country a year earlier. Here is something that many may have missed: gold experienced its own mini-version of a ‘flash-crash’ on April 30. According to Bloomberg’s Nicholas Larkin, "Comex halted trading in gold futures for about 10 seconds yesterday after prices plunged, Dow Jones reported, citing an unidentified spokesman for the exchange. The so-called Stop Logic halt began at 8:31 a.m. in New York on June futures. The metal dropped about $14.50 shortly before 8:30 a.m. local time." Evidently, ten-second halts, errors, and all that aside, this kind of trading halt can (and on occasion does) affect all types of markets. File this one under: factoids that are not unimportant. Meanwhile, the US Mint’s-reported gold-coin sales totaled only 20,000 ounces in April, notably down from the 62,500 ounces sold in March and seriously down from the 108,000 ounces that were sold in April of 2011. April’s sales tally amounted to the Mint’s lowest monthly sales figure since June of 2008. As for the speculative crowd on the exchanges, the story is about more of…the same; less enthusiasm. "managed-money accounts whittled down their net-long position in gold, cutting it to 107,600 contracts, reversing the modest gain made in the previous report. Managed-money accounts trimmed 2,225 gross longs and added 2,450 gross shorts. Producers and swap dealers both reduced their net-short positions by adding to gross longs and trimming gross shorts. This is the smallest net-long position for managed-money accounts since the disaggregated report for gold began in September 2009." "that Fed presidents and the central bank’s chairman, Ben Bernanke, are seemingly omnipresent at conference and media events these days. In addition to Evans and Lockhart, the heads of the San Francisco and Dallas Federal Reserve banks spoke at the Milken Conference." Dallas Fed President Fisher spoke to Bloomberg television on Monday and flat-out expressed opposition to any further Fed QE programs, saying at the same time that "monetary policy is one thing but it’s a very limited tool." Translation: the Fed will not solve unemployment with its QE blunt instrument but it might spark inflation level that nobody wants. Mr. Fisher did acknowledge that his institution may have boxed itself into somewhat of a tight corner and has made a quick exit from the current paradigm a tad difficult. Separately, The President of the San Francisco Fed, John Williams, said that the US economic outlook that he is currently observing "doesn’t warrant more bond buying," and Atlanta Fed President Dennis Lockhart repeated that he’s skeptical of the benefits of such action. Remarkably, the time has now come when the Fed’s hawks as well as its doves are suddenly in accord about not easing any further. This is taking place at the same time as insistent assertions of quite the opposite scenario keep habitually popping up in the financial media. The difference is that the factions that enivison endless QE are now being met with increasing amounts of denial — and some of it from the official sector itself-for the first time in three or more years. In any case, not easing more is one thing; raising rates is quite another. We also heard words on that topic this week. Richmond Fed President Lacker, speaking at the Bloomberg Washington Summit on Tuesday, said that the US central bank needs to stand ready to raise interest rates even if the unemployment level in America remains stubbornly above the seven percent figure. Which, it might just do, if recent indications are to be believed. In Mr. Lacker’s opinion, the time to hike might come in a little more than one year from now and that it is a [very common] "misconception to think we have to get unemployment all the way down to five or some number like that before we raise rates." Others disagree and would like to see even more easing from the Fed in order to cure the jobless situation — regardless of the risks such moves might present in terms of inflation. Following up on last week’s mention of certain commonly-accepted myths in the world of commodities, we now bring you this video clip from our own BNN television. Mr. Jeff Christian of the CPM Group in New York appeared on Business Day and stated his team’s finding about why exploding world population does not necessarily yield exponential gains in the real inflation-adjusted price of "stuff" (quite the opposite, in fact). Despite holding such "unorthodox" views, Mr. Christian remarked that he is often very well-received at certain commodity conferences. Mr. Christian also said that he likes the prospects offered by palladium, Platinum, rhodium, iridium, ruthenium, and certain agriculturals. The take — away quote from Mr. Christian’s clip was (Nota Bene): "We are paid to be correct, not to be bullish or bearish." Until Friday (and beyond), so are we.